Oct 03, 2011 Though it is a question from an elementary school, not all people can answer correctly how many states there are in the USA. If you have any doubts about it, we will help you. Forty eight states are contiguous1. They are located between Mexico and Canada on the North American continent. Hawaii and Alaska are not attached to the other states. Hawaii is situated on the Hawaiian Islands in the south Pacific. Alaska is the largest state of the USA, located to the north-west of Canada. In was bought from Russia in the 19th century. The USA also owns several smaller territories around the world, but they are not the states. The table below is the list of all the states. It also tells when they were joined to the Union and what their nicknames are. Some people think that Puerto Rico is one of the USA states, but it is wrong. This country voted on it several times, and always decided not to join to the USA. Puerto Ricans are American citizens but their country is just a US unincorporated territory, like Guam, Virgin Islands, etc. 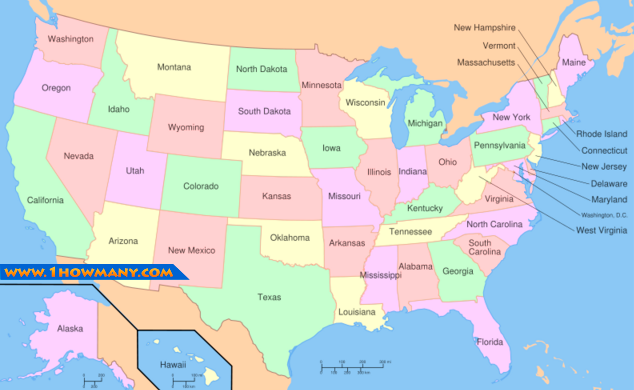 A contiguous state is one of the forty eight USA states on the North American continent that are north of Mexico and south of Canada. Hawaii and Alaska are the only two U.S. states that are not contiguous.